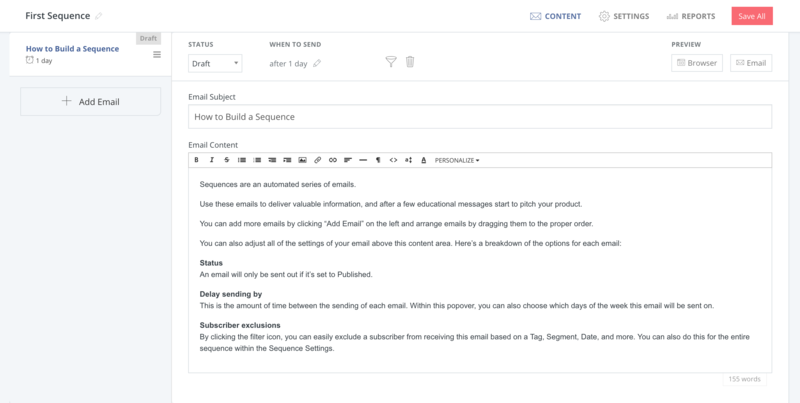 Everything you need to know about automating your emails with Sequences. Click 'Sequences' in the top menu. Click "Create a Sequence" in the top right corner of the page. You will be redirected to the Content page of your Sequence. You can fill in this content, and add as many emails to this Sequence as you like! Let's chat about how to fill in the details. You can edit the timing of your email at the top of the editor. The first email in a Sequence will be triggered by a subscription, so the timing will be in the "days after subscription" format. If you'd like this email to go out immediately, set this number to 0. The rest of the emails in a Sequence will be based on the previous email, so the timing will be in the "days after last email" format. By default, the Sequence emails will send at the Default time set on your Accounts page, but you can customize this on a per-Sequence basis in your Settings. This subject will show up in your Subscribers' inboxes and email. It will also change in left hand menu as you edit. Our Email Editor for Sequences is the same as it is for Broadcasts. Use the toolbar to change the text formatting and style, or to add images, links or files. Your Sequence email can be in Draft or Published. When in Draft, emails will not be sent. Once Published, emails will send on schedule. You can Preview in a Browser window or send a test email to yourself to see it in your inbox. This will delete the particular email you have open from your Sequence completely. This will save any changes made Sequence-wide. You can edit multiple emails within a Sequence at a time, and then click Save All to save all of your changes. You can click into any Sequence email to make changes. You can also re-order Sequence emails using the left sidebar. Add more emails by clicking the "Add Emails" button at the bottom. There is currently no limit to the amount of emails in a Sequence, so it can be as long or as short as you'd like! You can change the name of your Sequence on this page. Again, this is internal only, so Subscribers will not see this. You can change who the Sequence is sent from. This can be set per Sequence, and all emails in that Sequence will be sending from the same address. NOTE: this address is also where replies will be sent. Select the days of the week you want to send your Sequence Emails and de-select the days you don't. You can also change the time your Sequence emails are sent, if you want it to be different from your account's default setting. Select the template you'd like your emails to use from the dropdown list. This template will be applied to all emails in the Sequence. If you exclude Subscribers from a Sequence, this means we won't deliver emails to any of your Subscribers who have any of the excluded Tags, Forms or Sequences, even if they're added to this Sequence via an Automation, or Form subscription. Make a copy of your Sequence. This will duplicate all emails and settings, but NOT Subscribers. Delete your Sequence from your account entirely. Be sure to click "Update Sequence" after making any changes! 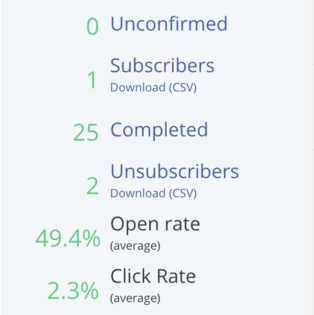 On the left side of your Reports page, you can see overall statistics and totals for your Sequence: Unconfirmed, Subscribers, Completed, Unsubscribers, and an overall Open and Click Percentage. On the right hand side, this page shows you aggregate stats per email. You can see the performance of a particular email, how many times that email has been sent, and how many people unsubscribed from that email. Subscribers who complete a Sequence, within a Visual Automation, will show as "Completed". Subscribers who are in a Sequence not in a Visual Automation will remain in that Sequence, unless manually removed. You can click "Unconfirmed," "Subscribed," "Confirmed," and "Unsubscribed" to see a list of these Subscribers. The best way to add new Subscribers to a Sequence is through an automation. The best way to add existing Subscribers to a Sequence is with Bulk Actions. The minimum spacing between Sequence emails is one hour apart, and there is no maximum amount of hours or days. You could have 30 days in between emails, or even a year! Sequences are based on the date of Subscription, (to the Sequence), not a specific time or day. Timed or date-specific content is better suited for Broadcasts. If you add an email later it will be sent out (like a Broadcast) to everyone who has received the last email. It will go out to newer Subscribers once they receive the email before it. 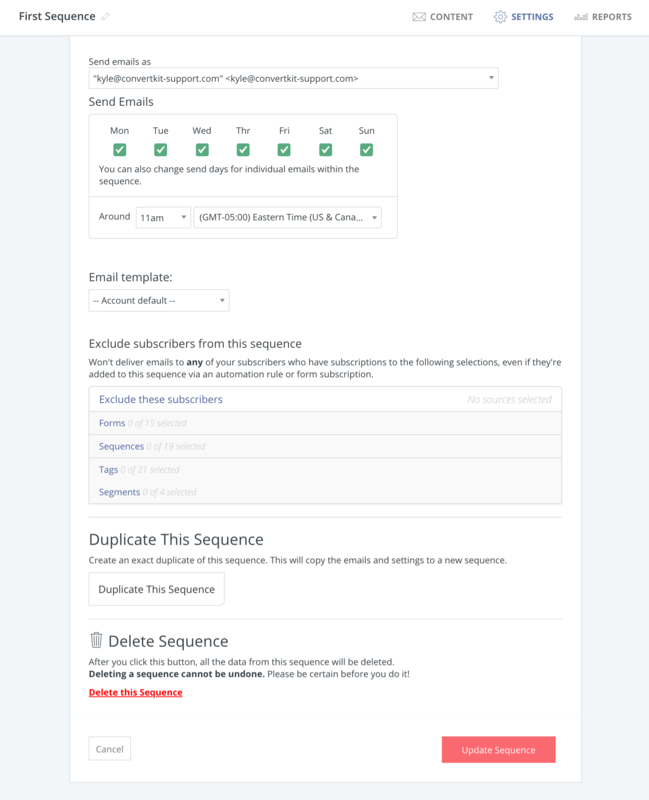 NOTE: If your Sequence is within a Visual Automation, and Subscribers have already completed the Sequence, they will not receive any new emails that you add to it. A good workaround for this is to create a published email, and set it to send 999 days later, to give yourself some time to add more emails. Additionally, if a Subscriber has been removed from the Sequence, either manually or through an automation, they will not receive any additional emails. How do I know if my Sequence is sending correctly? On your Reports page, click "Subscribers" on the left hand side. Click into a Subscriber's profile to see what Sequence emails they have received, and when they received them. When should I exclude Subscribers? NOTE: If your Sequence is a sales pitch, excluding customers from the product you're pitching is a great use of this feature! If you've set up custom unsubscribe links, exclude Subscribers that have elected not to receive your Sequence anymore. How can I send the first Sequence email right away? Set the first email of the Sequence to send "0" days after subscription.